National Soft Serve Day is August 19 – Celebrate It! Did you know there is a national holiday devoted to soft serve ice cream? Yes and it’s quickly approaching. No need to have a meltdown…we’ve put together an entire website devoted to helping you celebrate National Soft Serve Day, www.nationalsoftserveday.com. Order your “Celebration Kit” from Frostline today. The most time sensitive tasks are requesting your complimentary “Celebration Kit” and Frostline t-shirts, as quantities are limited. The “Celebration Kit” contains turnkey POS materials like posters, window clings and stickers. As you know, Frostline isn’t stingy when it comes to our professionally created digital content. Feel free to download our unique National Soft Serve Day images so that you can share them with your customers. Furthermore, make sure to click the image that brings you to our soft serve contest. We are giving away a year’s supply of soft serve mix! Just think of the profit you’re already making by using our cost effective, quality dry mix. 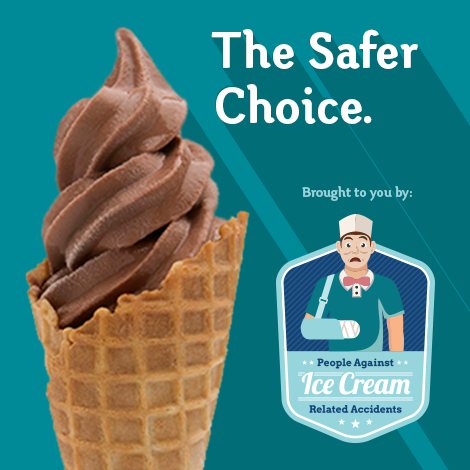 While you on the website, please check in on our task force, “People Against Ice Cream Related Accidents” (PAICA). The group is working hard to showcase the common pain points of serving hard-packed ice cream, such as “scoop burnout”, “deep dip discomfort” and “lopsided limb”. Feel free to share with us on our Facebook or Twitter pages an embarrassing or memorable incident where you experienced an ice cream party foul or on-the-job fail. We look forward to your success with National Soft Serve Day. Make sure to use the hashtag #NationalSoftServeDay so that we “soft-servers” can celebrate together and have a little fun!